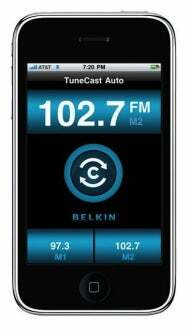 Belkin on Thursday announced the upcoming TuneCast Auto Live, an FM transmitter for broadcasting your iPhone's audio through your car's stereo system. The TuneCast Auto Live hardware will function much like that of current TuneCast models, letting you choose a broadcast frequency manually or using Belkin's ClearScan station-seeking technology. The new TuneCast will plug into your car's accessory ("cigarette lighter" jack) and charge your iPhone. However, you'll also be able to control the new device using a free iPhone app, ClearScan Live, downloadable through the iTunes App Store. The application will allow you to change the transmission frequency, save presets, and rate frequencies in your area. It will also be able to take advantage of the iPhone's GPS functionality to determine your geographic location and then present you with the best "known" clear frequencies for that location based on your ratings and those of other TuneCast Auto Live users. Belkin says the $80 TuneCast Auto Live will be available in "early fall." The iPhone app requires iPhone software 3.0, as Belkin says it is the first application to use the 3.0 software's capability to work directly with a hardware accessory. The transmitter hardware will also work with the current iPod nano and iPod classic.